This page is best viewed with IE and a resolution of 600x800 or better. Hi, my name is Karen, welcome to my little corner of the web. The purpose of this webpage is to tell you a little bit about me and my family. I hope you enjoy your stay, feel free to sign my guestbook or send me an e-mail if you have any comments or suggestions. One of my biggest accomplishments has been losing over 100 lbs. 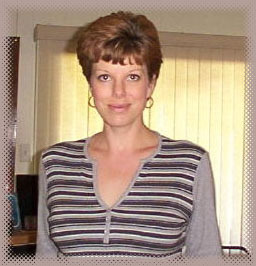 If you are interested in hearing more about my story, have a look at my weight loss story page. Want to see the changes? Check out my before & after pictures page. I have also put together some weight loss links that were useful to me. In May of 2001, I was diagnosed with an autoimmune disease called antiphospholipid syndrome or APS as the other name is a mouthful! If you are interested in learning more about the disease, please look at my APS information page or my APS links page. Let me know you were here, sign my guestbook. This page was designed and created by me.